← What do you do AFTER a KB Cert…or, How Can I Play with my New Toy? With this new material, strength coach Dan John discusses his current thinking on the fundamental human movements. Here he’s talking not about so much about drills and body parts, but about an overriding concept that covers ideas such as pushing, pulling, hinging and work capacity. “First and foremost, the body is one piece. You are not a collection of parts. If you get the stomach flu, you probably are not going to squat well that day. If you think a lift is an upper body lift, I’m going to poke a fork in your thigh and see if it really does affect it. You are one piece. You are one magnificent piece and that’s how you are. If you’re ill, it’s going to affect your training. If you broke up with your girlfriend, it’s going to affect your performance. You’re one piece. “Number two comes to us in several parts, but it will make sense. There are three kinds of strength training— first, putting weight overhead; second, picking it up off the ground; and third, carrying it for time and distance. We put weights overhead. We pick weights up off the ground. We carry weights for a while and that’s a pretty good training program. 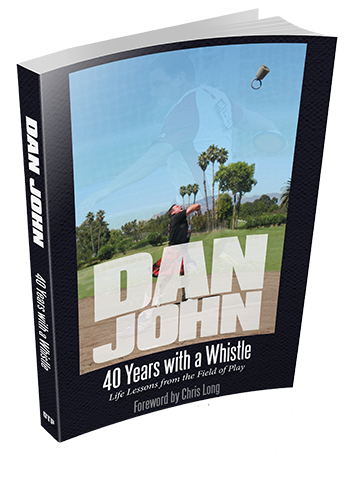 In Dan John’s decades-long coaching career, he’s worked with a lot of elite athletes. In this talk, he drills down to the five main characteristics that make an athlete elite. “The biggest mistake I see is people try to get strong too late. You want to get as strong as you can as early as you can in your yearly cycle, and then not worry about strength anymore. It should be something that’s in your pocket for the rest of the year. “This is a point I was going to bring up later, but this is a perfect time for it. Let’s use the 2016 Olympics, the one that’s coming up as an example. In 2016 is when they put the pedal to the metal, but, if you talk to the elite throwers, the year they get as big, bulky and strong as an ox is in 2015. It’s the year before the Olympic year you want to get the biggest engine you can get. Personal and group challenges are one way Dan John creates bus-bench programming for himself and his athletes or clients. In this talk, he describes the philosophy behind these challenges, and offers a few examples. In this lecture, Dan explains how to use his quadrants concept to combine diet and exercise programming. How do we balance hard dieting with hard training? Can it be done? For how long? You’ll have a clear plan at the end of this talk. Most of us, and probably all of your clients, don’t have any trouble jumping on board with a new plan. Where we usually go wrong is when the enthusiasm wears thin and we discover there was no goal behind the big jump. Here Dan explains how to build a goal you or your clients can see through to the end.